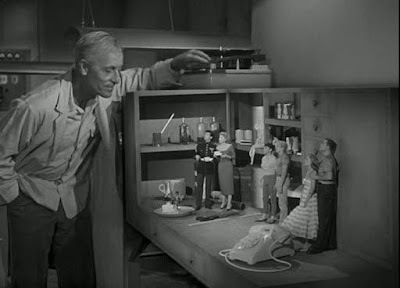 Although not on a par with "The Incredible Shrinking Man," the effects are OK considering the low budget, the acting performances are competent and the film’s pace never allows boredom to set in. A deranged doll-maker afraid of being alone! A machine that can shrink humans down to only a few inches tall! A collection of miniature prisoners forced to perform and serve as living dolls! What can the pint-sized plaything puppets do to save themselves? “These are the Brownies from the Valley High School. The girls are here to visit the factory”: So, begins our film with a Brownie troop visiting doll manufacturing company Dolls Inc., Room 502 situated in the Tilford Building in downtown Los Angeles. It is owned and operated by a certain, Mr. Franz. 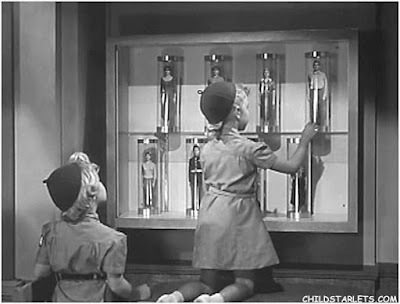 As the girls check out the display of dolls, they see a number of very lifelike dolls (perhaps too lifelike!) stored in glass containers in a display case on the wall. 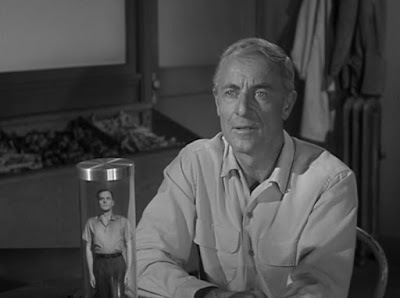 One of the dolls catches the eye of one of the girls and just as she reaches for it, the secretary quickly intervenes and tells her, “Don’t let Mr. Franz catch you. He’s very finicky about these dolls. Nobody’s allowed to touch them.” For “finicky” we might read, obsessive and possessive. Sally Reynolds answers an ad in the paper for a secretary/receptionist. The easy work and good pay job description makes it seem a little too good to be true. Despite the fact that Sally’s only work experience consists of working in a college bookstore for a year, Mr Franz seems to be over-eager in his willingness for her to start right away. Could it have something to do with the fact that she’s not married and hasn’t got any family? In other words, no-one who will miss her? Despite her obvious concerns, Sally reluctantly agrees to take the job. 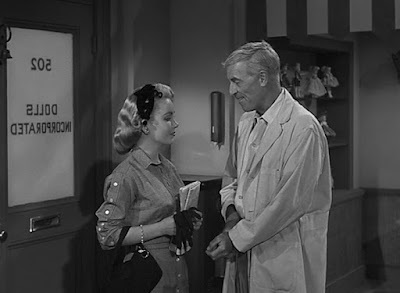 Three weeks later a traveling salesman by the name of Bob Westley bursts into the office, spots Sally, comes out with a cringe-worthy line like, “Well, Hello! Who are you?” and wastes no time in invading Sally’s personal space, grabbing her upper arm and twirling her around. Leading ladies in those days must have suffered terribly from multiple contusions on their arms inflicted by their male co-stars. It turns out that this idiot Bob Westley is a salesman from St. Louis and is Franz’s business associate and the company he represents is one of the main sellers or distributors of Dolls Inc., products. In the meantime, other strange events have been occurring such as when Sally learned about “whatever happened to that friendly fellow who brought the mail for so long.” It turns out that just two days before old Ernie was “to retire and get a pension, he disappeared. Started out one morning with his mail sack and never came back.” Nudge, nudge, wink, wink…say no more! In the next scene, Mr Franz receives a visit from his old-time friend and former show business partner, Emil. In addition to learning that Franz had at least been a good friend to someone in his life, we learn a bit about his past and some of the occurrences that may have affected his present psychological and emotional state. First, we learn that it’s been a while since Franz was involved in show business which he appears to have given up for good. Secondly, Franz once had a wife by the name of Emma “the girl with the beautiful golden hair” who “ran away with someone she liked better – an acrobat.” while his “marionettes were playing in Luxembourg.” Could it be that Sally reminds Franz of his former wife? Thirdly, as Emile pointed out, the present state of Franz’s apparent “contentment” is somewhat “unnatural” and may stem from the fact that his former wife’s leaving him must have done him “a great deal of harm.” This has caused Franz to “run away from life” and surround himself “with all shapes of people: their faces, their legs, their arms…even little mannequins of them. But not their spirit” of which he is afraid. For Franz, there is one thing in his mind he is certain of - that his dolls will never leave him. There are many unbelievable elements to the plot of this film, but among the biggest is how quickly Sally falls for Bob after his assault on her upper arm and how after a mere three weeks of hanging around LA Bob proposes marriage to Sally who kind of almost luke-warmly agrees. 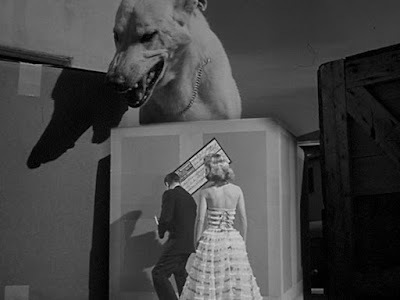 Perhaps she wanted to watch the rest of the film, The Amazing Colossal Man. WANT TO GO BACK AND TELL YOUR FRIENDS ABOUT THE MONSTER? THE CIRCUS FREAK? THAT'S RIGHT, SERGEANT. I'M A CIRCUS FREAK. HAVE A TENT, WILL TRAVEL. 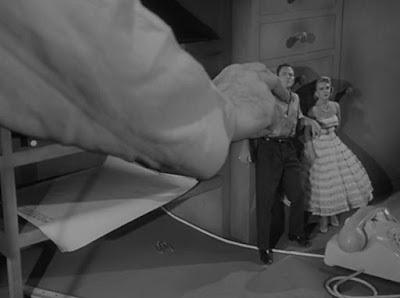 WHY DON'T YOU MAKE A SIGN SAYING: "SEE THE AMAZING COLOSSAL MAN"? What is taking place on the screen is an inverse situation of what is happening in Mr Franz’s workshop. Both situations are the result or consequence of human science. Sally is now all set to pack her bags for St. Louis when she returns to her apartment and agrees to Bob organising her affairs and informing her boss not to expect her to return to work again. The next day a rather surprised Sally receives a call from Franz asking her if she isn’t feeling well. Franz informs Sally that Bob has returned home to take care of business. When sally returns to work later that day, this indicates to Franz’s way of thinking that “things are as they should be.” Franz informs Sally that Bob left for St. Louis by train instead of by air and that “he’d been neglecting his business lately.” He apparently, according to Franz, did mention something about their marriage and led Franz to believe that Sally wouldn’t have worked for him after they were married. 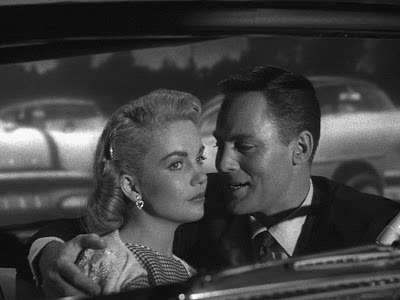 After declaring (rather meaningfully) “how sad it is when people go,” Franz advises Sally to forget Bob. The unexpected news concerning Bob together with the apparent mysterious disappearance of Janet Hall whom people are still trying to contact via Dolls Inc., have set the wheels of suspicion turning in Sally’s mind. Sally suddenly spots a new doll that remarkably resembles Bob. She asks Franz, “When did you make this, Mr. Franz?” She then observes, “It could be him, almost.” Thanking Sally for the compliment, Franz goes on to explain the intent of his art by which “the aim of every composer is to fit the world within the limits of his symphony” and it is this aim he seeks to achieve by making his dolls in the image of those he knows and loves. 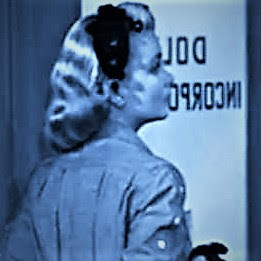 A by now frightened and alarmed Sally goes to the Los Angeles Police Department on her lunch break armed with an unbelievable accusation that her employer, Mr. Franz has somehow contrived to shrink her fiancé and other people into dolls. Sergeant Paterson is understandably sceptical until Sally happens to name the subjects of two recent missing-person investigations – mailman, Ernie Larson and secretary, Janet Hall. His interest piqued, Paterson decides to investigate, but Franz is able to convince him that the dolls resemble living people because, “I model all my dolls after people I know and like – people I like to have near me.” Of course, this is true, but it leaves out one important fact, one that Sally is aware of. Franz’s crushing of the doll demonstrates to Paterson that his dolls are in fact just dolls. Knowing now what Sally suspects, Mr. Franz’s actions also demonstrate to Sally the power he has to snuff out life if he is crossed. Sally has now become a problem which must be dealt with. After Paterson leaves Sally informs Franz that she can no longer work for him. Franz asks her, “how could I ever bare to let you go? 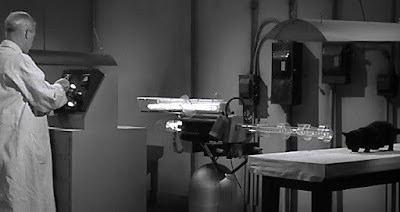 With the only exit now locked, Sally undergoes the process of being shrunken down by means of a machine he developed which can shrink people down to a sixth of their original size before being placed in suspended animation. When Sally wakes up and discovers to her mortification that she is covered only in a napkin, Franz asks her, “My dear, you aren’t afraid of me are you? Why, I’m your friend.” He then tells her it is time for her to put on her new clothes and shows her a miniature hair brush and stockings for her use. It is almost as if Franz were acting out the role of a little girl being wrapped up in a childish fantasy world playing with and talking to her little dolly! As Bob is being revived and eventually recovers, Franz wonders why those he has shrunken always hate him at first. After all, they are not harmed, they get the best care and are not allowed to become “too warm or cold, too hungry or too tired.” In fact, they should be grateful to have “no daily grind, no budget problems, no taxes or debts or family to support.” Their lives will just consist of sleeping away the boring hours in their jars and having fun when they are woken up to enjoy some new treat that Franz has thought up for them. In short, they are to live out their lives as happy little pets! So, you clever armchair pseudo-scientists out there! We know you’re so damn clever so don’t even bother nit-picking this gobbledygook. It’s a science fiction film, after all, so just enjoy it for what it is. Franz had me with the tuning fork smashing the glass! After putting poor old Tommy, the cat through the indignity of his shrinking process, Franz awakens his captives to enjoy a welcoming party for the two newcomers, Sally and Bob. 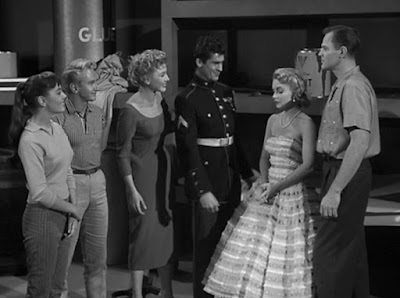 There’s Mac, a U.S. Marine; a teenager called Stan; a floozy by the name of Georgia Lane and Laurie, a young lady who can sing. This mode of thinking is scarily like the acceptance that seems to be spreading worldwide whereby we readily accent to having our freedoms curtailed in the interests of national security. Thus, we face an Orwellian form of new think which accommodates two opposing concepts: The need to protect freedom by restricting personal freedoms! 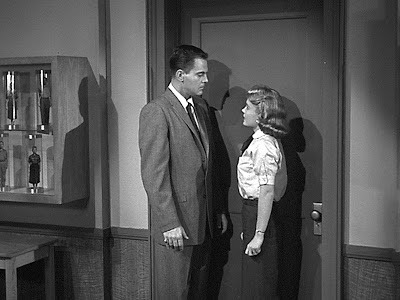 Instead to submitting to Franz’s demented miniaturized, constricted and limiting construct of reality, Bob and Sally decide that it is time to act and prepare for their escape. After managing to win over their new fellow vertically challenged comrades to their way of thinking, a plan is soon hatched to access the shrinking machine and revert everybody back to normal size. While the escape plan is being put into effect, the tension is ramped up with the arrival of Franz’s old friend, the well-meaning Emil. It is apparent that he’s a pretty persistent old bugger as he attempts to cajole his friend into returning to the stage. In fact, he seems determined to hang around like the smell of a fried onion or curry-fed fart. 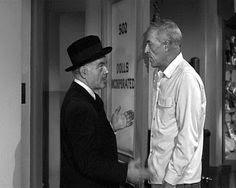 No sooner than Emil is levered out the door, Sergeant Paterson pays a visit to question Franz concerning people he is acquainted with who have gone missing. The noose is definitely tightening as Paterson asks Franz about his “advertising for another secretary” and how he happened “to lose Sally Reynolds.” Paterson is also there to ask Franz about what could have become of Bob. Up goes the level of tension another notch and tighter feels the noose as yet another visitor intrudes into Franz’s den of diminution! Little Agnes, the brat from the Brownie troupe, has come to Dolls Inc., to have her “bad dolly” Suzie repaired as it “ran out in the street” while she wasn’t looking.” A little girl wandering alone unaccompanied into an old man’s workshop on the 5th floor of a building in the city is not something that would be contemplated these days. They certainly were different times! Franz struggles valiantly to maintain the semblance of a calm façade when suddenly Agnes spots the now tiny feline Tommy who has popped out of a match box on the bench. Not only that, but Paterson expresses a desire to see Franz’s workroom. Luckily, Paterson has to leave quickly just as Franz is about to nonchalantly demonstrate how the “photographic enlarger’ works. He also manages to fob Agnes off by promising her that she can come over anytime to play with a talking doll and of course, the little cat. There’s no use the little people trying to use the phone again to summon help since, despite there being no loud music this time, there is the danger that Franz would hear them. As for writing a note on a piece of paper, making a paper plane out of it and throwing it out the open window…….well, that was never likely going to work, was it? Bob and Sally eventually manage to escape after Franz's coffee is drugged and Bob goes UFC all over one of the marionette puppets. However, it’s only 5.30 am and everyone is still asleep. Their only choice is to make it back to Franz's workshop, but not before dodging the attentions of a dog and figuring out a way of making it to the fifth floor. Meanwhile, Paterson has turned up at the door of the workshop just as little Agnes arrives there, once again unaccompanied! She tells Paterson what would normally seem to be a wild child’s fantasy story about “little people” being made “out of big ones with a machine…. 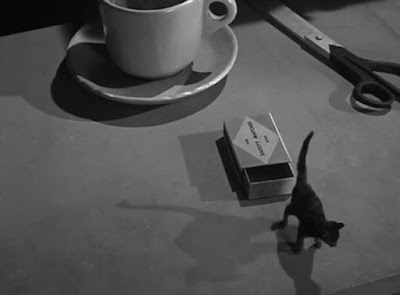 people that walk and talk and everything” and “a little tiny kitty” which Mr Franz keeps in a matchbox. As Paterson takes Agnes off to school we are once again left wondering, where are her bloody parents? Franz manages to track down Sally and Bob who have entered the workshop by hitching a ride in a parcel that was delivered. Before Franz can do anything, they are able to return themselves to normal size. 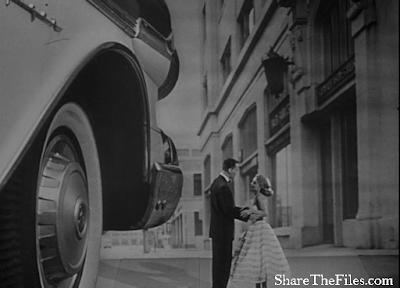 Bob and Sally then leave to summon the police, leaving a pitiful Franz to call out….” Don’t leave me! Please don’t leave me! Don’t leave me! I’ll be alone! This is to be his ultimate punishment! 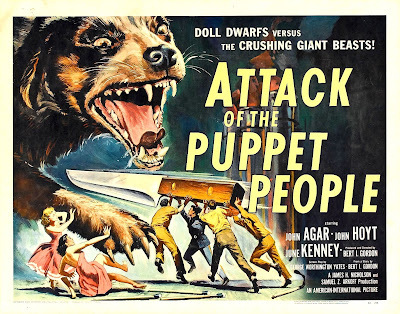 Attack of the Puppet People was also known as I Was a Teenage Doll, Six Inches Tall and The Fantastic Puppet People. 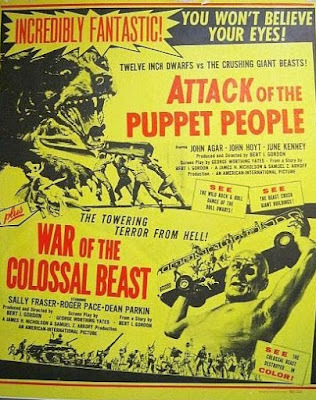 It was distributed by American International Pictures as a double feature with War of the Colossal Beast. 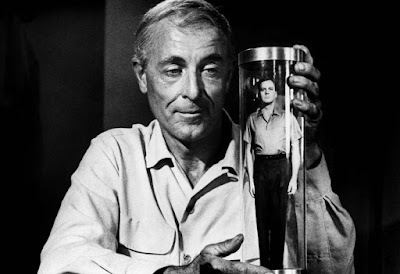 The film was rushed into production by American International Pictures to capitalize on the success of Universal-International's, The Incredible Shrinking Man, which had been released in 1957. 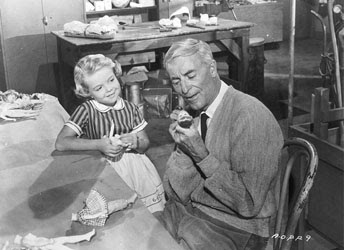 Director Bert I. Gordon's daughter, Susan who played Agnes, was a last-minute substitute for another actress who was ill and unable to work. It is said that Attack of the Puppet People played a role during the Watergate incident. Apparently, a Watergate burglar was so engrossed in watching the film that he failed to warn his co-conspirators of the presence of detectives. 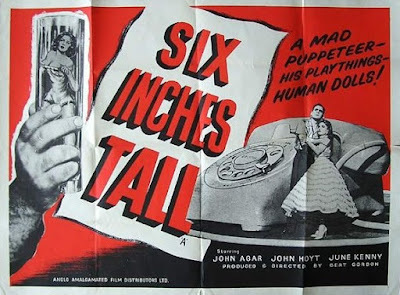 The film’s title is a bit misleading in that Franz’s captives don’t really attack anyone except perhaps for a Dr Jekyll marionette which John Agar beats to a pulp. 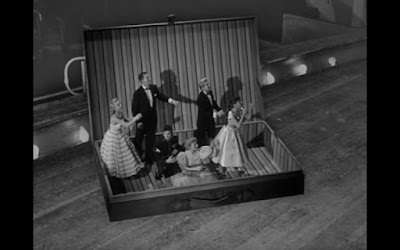 A major theme of the film is the consideration of loneliness and how it can be an all-consuming force that can eat away at the fabric of a person’s soul and sanity. Thus, we have a non-stereotypical mad scientist who is really a lonely old man in need of company. He may intend no harm, but his view of reality has become so warped that he is unable to see what he has become – an obsessed, demented and insanely possessive old man. 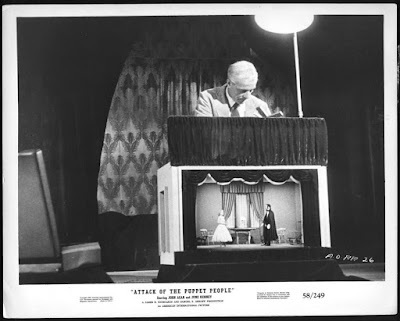 Attack of the Puppet People has some level of relevance to audiences in any age. For instance, many of us have from time to time like the character, Sally made what might be called fateful decisions. After all, Sally decided in a modern sense, to stand at the crossroads by venturing via the elevator up to the fifth floor to Franz’s workshop. It was she who decided to apply for the job as secretary. She also allowed herself to be talked into accepting the position. Her decisions set in motion a chain of events that were to have a profound effect on her life. And yet we like to think (as Hollywood often tritely tries to convey to us in its films) that we are in control of our own destinies. Perhaps there are puppet master-like forces at work over which we have no control, and which guide our actions and individual fates? At least that is how it often feels to many people at least in the material world of human affairs and civilization: that feeling of a lack of personal control and of being manipulated by forces that are too overwhelming and powerful. If it feels that way, then it is more than likely that it is indeed the case. Too many of us are far too content to play the role of mindless marionette puppets too ignorant, distracted, busy, complicit, complacent, frightened or too indolent to work out who is in fact pulling the strings, for whose benefit and for what purpose. Perhaps only by taking action aimed at cutting the strings by which our puppet masters control and manipulate us can we claim to have any chance at gaining control over our individual and collective destinies.